There are two indispensable conditions for this kind of decipherment. The first is to pay close attention to context, asking always where and in what combinations design elements or complete designs are used. The second condition is to be able to sort the monuments according to date. It is not necessary to know their dates in years, but we do need to be able to tell, in any comparison, whether two pieces are contemporary or not, and if not, which is the earlier. The failure of previous attempts to understand Chavin art can be traced in part to the fact that they did not fulfill these conditions. To avoid old difficulties in the present inquiry, it will be convenient to begin by talking about place and time. Chavin is the modern name of a small town located in a fertile valley on the northeastern slope of the main range of the Peruvian Andes at an altitude of 3,135 meters (about 10,200 feet). Just outside this town, which is also called Chavin de Huantar and San Pedro de Chavin, are the ruins of a great temple which is one of the most remarkable surviving monuments of American antiquity. The temple is a masonry structure and was originally richly ornamented with stone sculpture and with reliefs modeled in clay plaster and painted. The settlement associated with this temple apparently occupied the whole area where the town of Chavin now stands and some of the fields around it as well. Since the ancient name of the temple and its associated settlement is not known, the name of the modern town is generally used to designate them. It was the stone sculpture at Chavin which first attracted the attention of explorers, and this sculpture became the basis for defining the Chavin style. When we say that an object from some other part of the country is decorated in the Chavin style we mean that it is in substantially the same style as the sculpture at Chavin. 2 The Chavin style was used not only for monumental sculpture -but also for small carvings in stone, bone and shell, for modeled and incised pottery, and for decorating textiles and repousse gold ornaments. There are naturally some variations in the designs which are attributable to the choice of materials and to considerations of scale. The site of Qotus ("Kotosh") near Huanuco marks at present the southern limit of discoveries of objects in the Chavin style in the sierra. The central sierra is so poorly explored, however, that future explorations may very well extend the area of Chavin occupation. To the north and west the Chavin style has been traced over a distance of about 400 kilometers. On the coast, objects in the Chavin style have been found as far south as Ica and as far north as Chiclayo. The site of Chavin is not the only one with an imposing temple in the Chavin style. Two more are known in the sierra, one at La Copa ("Kuntur Wasi"), west of Cajamarca, and the other at Pacopampa near the northern edge of known Chavin territory. On the coast there is a great temple at Garagay, 7 km. north of Lima, the plan of which is very similar to that of Chavin, and other famous shrines at Mojeque and Pallca in the Casma Valley and at Cerro Blanco in the valley of Nepena. In the present state of our knowledge we cannot say that Chavin was the ultimate center of origin of the Chavin style, although the style presumably originated somewhere in the area of its distribution. The available evidence suggests, however, that Chavin became an important center for the distribution of ideas of religious art. At the same time that the Chavin style dominated the art of northern Peru a different style, called Paracas from the place where it was first recognized, was flourishing to the south of it. The Paracas style, with many local variations, has been found along the coast from Canete in the north to Yauca in the south, and in the sierra near Ayacucho. Its full extent has not yet been traced. The Paracas style had close relations with Chavin, although it had many distinctive characteristics. No Paracas stone sculpture is known, but Chavin influence is evident in designs on pottery vessels, pyro-engraved gourds, and textiles. Dates in years for the decorative styles of ancient Peru are based on radiocarbon measurements. None of the results of measurements made on samples supposedly having Chavin style associations inspires much confidence, but the determinations made on earlier and later materials indicate the general order of antiquity of the Chavin style. On the basis of this kind of evidence it now appears that the Chavin style flourished between about 1200 and about 300 B.C. Its origins have not yet been found and may go back considerably further. Constant change is apparently a universal characteristic of art styles, and it is not surprising to find that there were substantial changes in Chavin art in the nine hundred years or so of its existence. By determining the order of these changes we can establish a scale which will enable us to determine which monuments are earlier and which are later. Much research remains to be done on this problem, but the general outlines of the sequence are already apparent. Our best evidence for the order of changes in the Chavin style is derived from a study of the Chavin influences reflected in the Paracas style pottery of the Ica Valley. The development of the Paracas tradition in Ica was the subject of an important study made by Lawrence E. Dawson and Dorothy Menzel of the University of California at Berkeley in 1959 and 1960. 3 These investigators were able to distinguish ten successive phases in the Ica variant of the Paracas style. This variant they call Ocucaje, after a section of the Ica Valley in which remains of this type are abundant, so that the phases of the sequence are designated "Ocucaje 1," "Ocucaje 2," and so on. The influence of the Chavin style is strong from Ocucaje 1 to Ocucaje 8, chiefly in the most elaborate pieces. Dorothy Menzel made the crucial observation that the Chavin influence in the Ocucaje sequence is not uniform; the Chavin features vary from one phase to another in a very consistent fashion, and features which are restricted to certain phases at Ica are found only on certain Chavin monuments. The order of changes in the Chavin influences in the Ocucaje sequence can be expected to reflect at least approximately the order of changes in Chavin art. Among the features of Chavin origin present in the Ocucaje sequence which have proved most useful in establishing time differences in Chavin art we may mention a decorative point at the corner of the mouth which appears at Ica first in Ocucaje 4, earlier Chavin influenced mouths having simple rounded or square corners. The mouth with this point should therefore be a relatively late feature at Chavin. Another useful feature is the treatment of twisted geometric figures. The curvilinear guilloche occurs early in the Ocucaje sequence, while the angular twined fret occurs only very late and can be shown to have developed out of the guilloche. Decorative curls acquire longer and longer stems. There is an increasing tendency to accommodate the design to a framework of parallel bands like the spaces on lined paper, with a consequent replacement of curved lines by straight ones. Using these features and a few others which occur in the Ocucaje sequence as guides, it has been possible to arrange the stone sculpture from Chavin in a consistent order which also makes sense in terms of other features not found on Ica pottery, or occurring there under circumstances which do not permit placement in time. Features of this sort which occur only in a relatively late context in Chavin art are eyes with angular eyebrows, the presence of a central fang on profile faces, triangular teeth in the mouths of principal faces, small snake heads in which the mouth is a continuation of the eyebrow line instead of being drawn separately, and the extension of lip and teeth over the profile of the face. While I was working at Chavin in 1961 it occurred to me that it might be possible to derive some independent evidence for the relative age of Chavin sculpture from the relationship of individual pieces of sculpture to successive phases in the construction of the temple. The inquiry turned out to be more valuable for establishing context than for finding evidence of time differences, but the results have some value for both purposes. Largely because of vandalism beginning in the Colonial period and lasting until the early years of the present century, most of the sculpture at Chavin has been removed from its original position. Much has been destroyed, and much is preserved only in battered fragments used as building stone in the village church and in private houses. There are, however, a few fragments remaining in or near their original locations which enable us to visualize how sculpture was used in the construction of the temple. The temple consists of a number of rectangular structures up to 12 meters in height which appear to be platforms of solid masonry designed to support shrines built on top of them (fig.2). These rectangular structures are not solid, however, but are honeycombed with interior passages and small rooms, roofed with large slabs of stone and connected with each other and with the open air by an effective system of ventilating ducts. There are traces of painted plaster on the walls of these passages, and in one of the rooms three of the slabs forming the ceiling have traces of low relief carving, now badly damaged. Most of the roofing slabs were not carved, however. The outside walls of the temple fabric were adorned with a row of human and animal heads, carved in the round, which projected from the facade. These heads were provided with stone tenons, rectangular in section, which fitted into sockets provided in the masonry. Above the row of heads was a projecting cornice of flat slabs with squared edges. The under side of this cornice, and in places the outer edge as well, was decorated with figures carved in low relief. Only one slab of this cornice is now in place, but others were found at the foot of the wall, presumably not far from where they had fallen. A number of rectangular stone slabs have been found, each with one side well finished and carved with a figure in relief with a frame around it. These slabs were apparently designed to be set in walls, but none has been found in its original position. One of the interior passages leads to a great image which was evidently a cult object of major importance, one of the few cult objects of ancient Peruvian religion which can still be seen in its original setting (fig. 5). It is a shaft of white granite, some 4.53 meters long, set upright in a gallery crossing. The stone has been carved in low relief to represent a figure in human form with the right hand raised. The scale of this Great Image and its setting in a dark passage give it an awe-inspiring-quality which can be felt even by a present day unbeliever, but which photographs and drawings fail to communicate. The Great Image, infelicitously called "the Lanzon" in the earlier literature, was probably the principal cult object of the original temple at Chavin, for it stands close to the central axis of the oldest part of the temple structure. The original temple seems to have been a U-shaped structure consisting of a main building and two wings enclosing three sides of a rectangular court, the open side being on the east. The whole structure occupied an area of some 116.30 by 72.60 meters (fig. 2). Subsequently the temple was enlarged several times and its center shifted. The two principal additions affected only the south wing, enlarging it until it formed a solid rectangular structure 70.80 by 72.60 meters in plan. The enlarged south wing was then treated as the main building of the temple; a new and larger court was laid out in front of it with flanking buildings on the north and south sides, again providing a U-shaped arrangement open to the east. The east front of the new main building, facing the court, was provided with a monumental portal, the south half of which was constructed of white granite and the north half of black limestone. We can call it the Black and White Portal (figs.3 and 4). The expansion of the south wing of the old temple until it became the main building of the new one probably reflected an increase in the importance of a deity which had originally been worshipped in the old south wing, an increase no doubt accompanied by a decline in the prestige of the deity of the Great Image. The original image of the deity of the south wing has not been found, probably because it was destroyed centuries ago. As we shall see, there may be a later representation of it, however. We cannot use the sequence of additions to the old south wing to establish the order in which the cornices and tenon heads of this part of the structure were carved, because there is evidence suggesting that older sculptures were reused when a new addition was built, and that damaged slabs in the older parts of the temple were replaced long after the original date of construction. The evidence is stylistic; some of the cornice blocks found by the walls of the second major addition are almost identical in style with the earliest ones from the old south wing, while the most advanced style cornice slab in the whole temple was found near a much earlier one at the foot of the wall of the old south wing. The sculptures associated with the Black and White Portal, however, do have some value in establishing a sequence of style changes in Chavin art. The Portal sculptures consist of two cylindrical columns, each carved with a single large figure in flat relief, and a short cornice decorated with a frieze of standing birds, also in relief (figs.8, 9, 15, 16). 4 The columns supported the lintel of the entrance, and the cornice must have rested on top of the lintel. The close structural relationship of these carved members, the dimensions of which indicate that all were cut for the positions they occupied in the Portal, suggests that they were all carved at the time the Portal was built. This inference is supported by the fact that the style of all three is virtually identical. We can therefore treat the Portal sculptures as a stylistic and chronological unit for purposes of comparison. From its position the Portal cannot be earlier than the construction of the second addition to the south wing, and it may be later; its sculptures, therefore, should represent a relatively late phase in the sequence of Chavin carvings. The evidence of Chavin influence at Ica also suggests a relatively late date for the style of the Black and White Portal, so there is no conflict in the evidence. The evidence now available is sufficient to suggest only the general outlines of a chronology for the Chavin style, a chronology much less detailed than the sequence we have for the contemporary Paracas style from Ica. For the present we can distinguish only four phases of Chavin art based on stylistic differences in the sculptures at Chavin itself; we can label these phases AB, C, D, and EF for convenience of reference. The use of the double letters, AB and EF, for the first and last of these phases will serve to remind us that it should be possible to subdivide them when a little more evidence is available. Turning to monuments from other sites and pieces without provenience, we can assign the temple reliefs at Cerro Blanco in Nepena to Phase C, and the lintel found at La Copa to EF. 8 The superb jaguar mortar in the University Museum in Philadelphia, the provenience of which is unknown, is a Phase AB piece, while Phase C is again represented by a carved bone spoon from the Huaura Valley. 9 Not all examples of Chavin art can be assigned to their proper phase in our present state of knowledge; only ones which happen to have some features which we can recognize as significant for chronology can be placed in the sequence. Naturally, the more complex and elaborate a Chavin design is the more likely it is to contain features which we can use for dating. The simple pieces are more likely to be difficult to handle. Nevertheless, for purposes of understanding Chavin art it is not necessary to be able to place every piece. What we need is enough of a sequence so that we can see what kinds of changes took place in the style, and that much is now available. Chavin art is basically representational, but its representational meaning is obscured by the conventions which govern the Chavin style and, in many cases, by the fact that representational details are not expressed literally but in a figurative or metaphorical fashion. These matters need to be explained before we can ask what Chavin artists were trying to represent. The most important conventions affecting the understanding of representation in Chavin art are symmetry, repetition, modular width, and the reduction of figures to a combination of straight lines, simple curves, and scrolls. Except for the tenon heads at Chavin, some figures modeled in clay at Mojeque, and a few stone mortars, conceived in the round, the task Chavin artists set themselves was to produce a linear design on a surface which was either flat or treated as if it were flat. The conventions must be seen in this context. The symmetry of Chavin designs is generally bilateral with relation to a vertical axis. n design and gives it a certain rhythm. When details are repeated they are as nearly identical as space will permit, while when whole figures are repeated the repetition need not be so mechanical. For example, the cornice of the Black and White Portal is ornamented with a frieze of standing birds (cf. figs. 15 and 16). The birds are represented in profile and all face the center line of the Portal, the two middle ones standing beak to beak. All the birds are about the same general size and shape, but in details they vary by pairs. There are two alike, then two more, alike but different from the first pair, and so on. Repetition of details became increasingly common in later Chavin art, and details came to be multiplied for the purpose of repetition without much regard for the requirements of the representation. 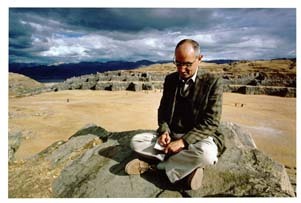 Modular width is an expression which Lawrence E. Dawson has suggested to designate a convention which is common to a number of art styles in ancient Peru. By the convention of modular width a design is composed of a series of bands of approximately equal width, and nonlinear features, such as eyes and noses, are accommodated to the modular framework as well. In Chavin art the bands tend to be adjacent and parallel, so that sections of a design look as though they had been drawn to follow parallel ruled guide lines, like the lines on ruled paper, a convention also found in the Paracas style, as we noted earlier. The accommodation of designs to modular banding became increasingly strict in late Chavin art, the curved lines of earlier designs being replaced in Phase EF by straight ones which interrupted the banding less. In earlier Chavin designs several different modular widths might be used for different parts of the design, thus providing variety; band width is more standard in the later phases. The reduction of figures to a combination of straight lines, simple curves, and scrolls led to the representation of anatomical features as more or less geometric figures. The pelage markings of jaguars, for example, are represented as quatrefoils or cinquefoils and crosses. These figures are reasonable approximations of the shape of jaguar markings in nature, though of course no natural jaguar marking would have the sharp corners and straight sides of the cross the Chavin artists used to represent it. It would be easy to mistake such geometric figures for abstract elements used simply to embellish empty spaces if we had to interpret them on the basis of a single example. Comparing many pieces, however, we find these particular figures occurring repeatedly on cats, while they are absent on representations of birds, snakes, and people. It is this kind of consistency in context which enables us to decide between alternate possible interpretations of ancient art. A similar argument based on the observation of context in many examples enables us to conclude that small scrolls or curls were common conventions for hair and for the down on birds. Eyes may be represented by circles, ovals, lens shaped figures, or rectangles, and some intermediate forms are also found. It is the figurative treatment of representations in Chavin art which has caused the most difficulty to modern observers. The question of why figurative expression was used in Chavin art is one which we can consider more profitably after we understand how it was used. The type of figurative elaboration which is characteristic of Chavin art is one with which we are more familiar in literary contexts; it is a series of visual comparisons often suggested by substitution. To give a literary example, if we say of a woman that "her hair is like snakes," we are making a direct comparison (simile). If we speak of "her snaky hairl" we are making an implied comparison (metaphor). we can go even further, however, and simply refer to "her nest of snakes," without using the word hair at all, and in this case we are making a comparison by substitution. In order to understand our expression the hearer or reader must either share with us the knowledge that hair is commonly compared to snakes or infer our meaning from the context. Comparison by substitution was an especially fashionable device in Old Norse court poetry, and it was given the name "kenning" by the thirteenth century Icelandic scholar Snorri Sturluson (1178-1241). This term, which implies that some knowledge or thought was required to understand the allusion intended, is appropriate and applies equally well to the comparisons by substitution in Chavin art. Figurative expressions, of course, lose their force as they become familiar and commonplace, and they may end by being no more than synonyms for the literal statement. In order to maintain the figurative character of the discourse, fading figures need to be strengthened by elaboration or replaced by new ones. The weakening to which popular figurative expressions are subject thus provides a motivation for changes. In Old Norse court poetry kenning became the chief basis on which verse was judged. The poets responded to this development in taste by devising ever more complex and far fetched kennings as well as increasing the frequency with which they used these figures. The elaboration of kennings was of two kinds, the kenning of kennings and the introduction of kennings which depended on a reference to a story which the hearers were assumed to know. "The seal's field" is a common kenning for the sea which would have been recognized immediately by Egills audience. The sea, in turn, is a kenning for the attacking force, sweeping forward against the king's battle line as the sea sweeps in to break in confusion on the rocks. Neither the attacking force nor the sea to which it is being compared is mentioned directly in this figure. In another place in the same poem Egil refers to poetry as "Odin's mead," using a kenning which involves a reference to a story, in this case the old Norse legend of the origin of poetry, not told in this poem. The same kind of development in the direction of increasing figurative complexity which we have described for Old Norse poetry took place also in Chavin art. Kennings became more numerous and more far fetched, and we can identify cases of the kenning of kennings. We cannot identify kennings referring to stories in any specific way, because the literary tradition is lost, but no doubt some of the figures which are difficult to interpret as simple visual comparisons are in fact kennings of this type. The way in which kennings and other comparisons were used in Chavin art can be seen most clearly in earlier pieces in which the comparisons are still relatively simple. Let us examine a few of the more common comparisons. A projecting appendage to the body may be compared to a tongue and hence shown issuing from the mouth of an extra face which is inserted in the body for the purpose. The tongue comparison is applied to the tail and feet of cat figures, the legs and feet of human figures, and the tail, wings, and feet of birds. Since an extended tongue would cover the lower jaw, the faces used in this comparison are agnathic; that is, the lower jaw is not shown. The extra faces may be represented either in front view or in profile. Sometimes, when a front view face would seem to be called for, we find instead two profile faces, drawn nose to nose, combining symmetry with repetition. The same bodily appendages which are compared to tongues may be compared simultaneously to necks and provided with a face at or near the end in consequence. A long appendage, such as a tail, may have an agnathic face part way down its length from which the rest of the appendage issues as a tongue. Smaller bodily appendages are usually compared to snakes, and in this case they usually issue directly from the body or from a simple ring in the earlier style. The hair and whiskers of cats are represented as snakes, and sometimes the ears as well. In bird representations the down on the head and the alula at the front of the wing may be shown in this way. Individual feathers usually end in faces, but it is not always clear whether they were thought of as representing snakes or simply as necks with a head at the end, snake heads not being always clearly distinguishable from other heads. On many of the tenon heads which represent human beings the hair is shown as snakes, and sometimes the long wrinkles of the face as well. Another common kenning is the use of greatly elongated mouths, best described as continuous mouth bands, to mark the major structural lines of the body. In the earlier examples of Chavin sculpture this device is used only to mark the main axis of the body, the axis of the backbone, in representations of birds with the wings spread, and the continuous band has no eyes or nose associated with it. In later Chavin art the continuous mouth band was used more freely, for example to mark the bony axis of bird's wings and the axis of the tail, and there is often a nose and an eye associated with it. The comparison intended by the continuous mouth band seems to be one between the strong but flexible structure of a chain of bones and the lines of teeth set in a pair of jaws. The commonest figurative device in all of Chavin art is one in which the mouth of almost any kind of creature may be represented as the mouth of a snarling cat, with the teeth bared and long pointed canines overlapping the lips. The cat the artists had in mind was probably the jaguar, legendary throughout tropical America for its courage and strength, because most of the complete cat figures shown in Chavin art have jaguar pelage markings. The cat mouth appears not only in its natural context, in representations of cats, but also as the mouth of human figures, of snakes, and, most incongruously, of birds. Birds shown with the head in profile, in fact, often have not only a jaguar mouth but a complete cat face with nose and forehead marking, the bird's beak and cere being attached to the profile like an ill-fitting mask. All faces used to establish the kennings of tongues and necks have cat mouths, and the continuous mouth band is a cat mouth also, as indicated by the presence of long canines. The cat mouth is not universal in Chavin art, however; there are some representations of human beings which do not have it. It is interesting that these human figures also lack kennings entirely. Small snake heads used as kennings for hair or down also lack the cat mouth, although larger snake heads have it. The logic behind the figurative use of the cat mouth in Chavin art is obscure. It is hard to see the cat mouth as a direct comparison, but on the other hand it has a very intimate association with the use of kennings, being used in all faces which establish kennings except for the small snake heads. Perhaps the most reasonable of several possible alternative explanations is that the cat mouth is used to distinguish divine and mythological beings from ordinary creatures of the world of nature, with the implication of a comparison between the power of the jaguar and supernatural power. If so, the cat mouth can be considered a kind of kenning also, although it differs from the others in that it involves a comparison of quality; it becomes an allegorical figure. The solution we have proposed for the problem of interpreting the significance of the cat mouth in Chavin art is supported by the further consideration that there are some suggestions from the archaeological context of the art that it is associated with religious ritual. All of the sculpture at Chavin with known provenience which uses the cat mouth figuratively is temple sculpture, and the clay reliefs at Cerro Blanco in Nepena have similar associations. One of the few lots of smaller objects in the Chavin style which has been found in some kind of association is a hoard of gold from the Hacienda Almendral, near Chongoyape, most of-which is now in the Museum of the American Indian in New York. 11 The lot includes four crowns with elaborate designs, eleven ear spools and a pair of tweezers, an assemblage most reasonably interpreted as ritual paraphernalia. Both at Chavin and in the Chongoyape crowns the more prominent the main figure in a design is the more kennings (i.e., the more cat mouths) it has associated with it. Perhaps the use of kennings was even proportional to the supernatural importance of the figure involved. The kennings we have discussed so far involve a single face for each kenning, and the faces themselves are treated more or less naturalistically. There is one comparison which involves a purely imaginative elaboration of figurative faces, however. Any long narrow feature such as a girdle or the body of a snake may be compared to a chain of connected profile faces; the girdle of the Great Image is a good example (fig. 5). The faces in the chain have two interesting peculiarities. In the first place, they are what we can call "dual faces"; that is, each mouth has an eye and a nose on each side of it, so that the mouth may be seen as shared by two faces, each upside down with respect to the other. In the second place, the faces are joined to one another by the device of a continuous lip band which runs from one mouth to the next across the profiles of the faces. The chain of faces was subject to further elaboration as the Chavin style developed. In later phases the part of the continuous lip band connecting different mouths across the profile of the face was interpreted as the lip of an agnathic mouth at right angles to the original ones, and it was supplied with the appropriate teeth. There was also some tendency to run the lip and teeth of single faces up over the profile, probably by analogy with the faces in the chains. As early as Phase AB we find front view agnathic faces provided with a pointed tooth in the center as well as the usual canines on each side. The central tooth is a pure product of the imagination which can be based on no observation of nature and represents simply the triumph of Chavin ideas of symmetry over the symmetry of nature. The idea later spread to other contexts. In Phase C the central tooth appears on profile faces with lower jaws, and this usage becomes standard in Phase D. The central tooth projects downward from the upper jaw and rests against the lower lip. Although the Chavin style is predominantly representational, as we have already note d, it does include a few abstract and purely decorative elements. On the Great Image, for example, a two-strand guilloche appears on the back and under the feet of the principal figure. In the latest phase of Chavin art an angular twined fret was developed out of the rounded guilloche, although guilloches also continued to be made. Another late development was the use of three-strand guilloches and twined frets as well as two-strand ones. As early as Phase C the guilloche acquired a representational meaning in some cases, being used to represent the twined bodies of two snakes. The difference is, of course, that such guilloches end in snake heads. Later the holes where the strands cross were supplied with eye pupils. Both of these developments represent reinterpretations of abstract shapes as representations, a type of reinterpretation made earlier by the fact that Chavin artists were accustomed to using geometric figures as representations of features of nature. Abstract elements are on the whole, commoner in the later sculpture from Chavin than in the earlier, and commoner on pottery than in sculpture. Some of them seem to be derived from earlier representational figures which came to be used out of context and were sufficiently ambiguous as figures so that their representational meaning was easily lost or ignored. For example, a simple figure like an S lying sideways is very common in later Chavin pottery and occurs also in later sculpture. It appears to be derived from a representation of an eyebrow with a curled end which is common in the earlier sculpture. An intermediate form appears on the bodies of the Phase AB cat figures which ornament the cornice on the southwest corner of the temple at Chavin (fig. 17). Here the S figure has a round eye in each end, and neither eye is in context as the eye of a face. The case of the S figure is, of course, the converse of that of the guilloche. It should ultimately be possible to write a kind of grammar of Chavin art which would provide a complete explanation of the conventions and kennings of even the most complex of the later designs. The observations offered here fall far short of such a grammar, but they should be sufficient to enable the reader to make intelligent observations of his own when he looks at Chavin designs, and that is the purpose of the present survey. Once we are able to recognize the elements in Chavin designs which are figurative or which represent purely decorative elaboration we can look behind such elements for the underlying representational meaning of the figures. For the most part, each figure is a separate problem; most Chavin compositions consist of a single principal figure which stands or acts alone, although it may have smaller subsidiary figures associated with it. The subsidiary figures are arranged according to the dictates of symmetry, however, and the arrangement does not necessarily reflect any narrative meaning. When one learns to see through the figurative elaboration of Chavin designs a surprising proportion of them turn out to be representations of natural bird, animal, and human forms. Since most of these forms are supplied with cat mouths and other kennings, they are presumably the forms of supernatural beings, but the point is that they are seldom monstrous forms. Beings which are part human and part animal in form do occur in Chavin art, as we shall see, but they are much less common than is generally supposed. Representations of cats are not particularly abundant in Chavin art and are virtually restricted to Phases AB and C. In most cases there is no question that the cat represented is a jaguar, the identification being given by conventionalized jaguar markings. On the cornice slab preserved at the southwest corner of the new temple at Chavin, however, there are two figures of cats, without the standard jaguar markings, which may be intended to represent pumas (fig. 17). Representations of other animals are very rare as principal figures in Chavin compositions. At Chavin itself, there are two snakes on the same cornice slab with the "pumas," and one representation of a monkey, one of a bat, and one which may possibly be intended for a viscacha, these last three being on flat relief slabs originally set into a wall. 13 Representations of crabs are fairly common on the coast but have not been found in the slerra. 14 Fish occur only as secondary figures, but they are quite common in that context. It is interesting that there are no representations of food animals, such as the deer, guanaco, and guinea pig, and none of several other animals which are common subjects in other Peruvian art styles, such as the fox, the lizard, and the frog. Plants and vegetable products are rarely shown in Chavin art and then only as secondary figures. The sculptured animal figures at the Chavin temple occur in three contexts, on cornices, on rectangular relief slabs made to be set in a wall, and in the form of tenon heads. In all three cases they serve as architectural decoration and are not given such emphasis that there is any reason to think that they may have served as cult figures. The eagles and jaguars which predominate on the cornices may have been thought of as supernatural beings which served the gods, but they were clearly not deities themselves. The other animals less commonly shown are perhaps figures from mythology. Figures with a human or animal form depicted with elaborate kennings are the ones most likely to represent deities o r important mythological beings, and our confidence that they do is increased by the contexts in which such figures occur. There is only one animal figure which is represented in Chavin art in such a way as to suggest that it might be a deity or important mythological figure, and that is the alligator, or more properly cayman, which is represented on the so-called "Tello Obelisk" (fig. 6) and in two other sculptures, a granite frieze found at the foot of the Monumental Stairway at Chavin (fig. 19) and a relief from Yauya (fig. 18). In all three cases the caymans are shown with elaborate kennings, and in two of them accompanied by subsidiary figures. The "Tello Obelisk" is a rectangular shaft, carved on all four sides, and is more likely to have been a cult object than a simple piece of architectural decoration. The caymans are represented with fish tails, but this mythical detail may be no more than a misunderstanding on the part of artists who were not personally familiar with their subjects, caymans occurring only at a much lower altitude. The Great Image in the interior of the old temple at Chavin certainly served as a cult object, and the principal figure shown on it can be taken to represent a deity. This figure (fig. 5) is human in form, apart from a moderate amount of figurative elaboration. The deity of the Great Image is represented standing, with his left arm at his side and his right arm raised. The hands are open and hold nothing. He wears ear pendants, a necklace, and apparently a tunic and girdle. His hair is kenned as snakes and his girdle as a chain of faces. The most peculiar feature of this figure is the mouth, which is very large, has the corners turned up, and is provided with upper canines only. Ordinary human figures have mouths of more modest proportions, the corners of which are either straight or turned down, while the ordinary figurative cat mouth has both upper and lower canines. The peculiar features of the mouth of the Great Image are paralleled in three tenon heads belonging to an early phase of the Chavin style. 16 In the tenon heads, however, the mouth is agnathic and has no teeth in it, while the mouth of the Great Image does have teeth, together with a lower lip and a lower jaw. The teeth and lower lip seem out of context here, and on close observation it can be seen that they do not fit. The artist's conception of the deity he was representing may have demanded this incongruous combination, but it is also possible that the figure was first carved with a toothless agnathic mouth and then the teeth and lower jaw added. A later representation of the same deity has also been found at Chavin on a beautifully finished relief slab found in a corner of the small patio in front of the Black and White Portal (fig. 21). The identification is based primarily on the mouth, which is large and has upturned corners, large backswept upper canines and no lower ones. This figure also has ear pendants which look as though they were copied from those of the Great Image. The figure on the relief slab holds a large spiral shell in the right hand and what appears to be a Spondylus shell in the left. 17 Shells such as these were common offerings in ancient Peru in many periods, and those which the deity holds very likely represent the offerings he expected from his worshippers. This cheerful deity deserves a name, and I propose to call him the Smiling God. We were able to identify the Smiling God as a deity because the Great Image, which represents him, is clearly a cult object. There are some other figures represented in the temple at Chavin which occur in such contexts that we can recognize them as lesser supernatural beings; these are the figures represented on the columns which flank the doorway in the Black and White Portal (figs. 8 and 9). These columns are working architectural members and hence unlikely to have served as cult objects. Each column is ornamented with one great figure in low relief, and each figure has the body, legs, and arms of a man, but the head, wings, and claws of a bird of prey. The bird attributes of the figure on the south column are those of an eagle, while the figure on the north column has the cheek markings of a hawk. The figures are standing, and each holds what is apparently a sword club across his body. Both figures are represented with elaborate kennings, those of the eagle figure being somewhat the more elaborate of the two. The position of the columns suggests that these figures represent supernatural beings stationed to guard the entrance to the temple, "angels" in the original sense of the word; that is, supernatural messengers and attendants of the gods. The guardian angels of the Black and White Portal were specifically the attendants of the god who was worshipped in the new temple, presumably the same one who had been worshipped in the south wing of the old temple. As we remarked earlier, his cult image has not been found, but it is possible to argue that we have other representations of him. There are two parts to the argument, the first involving the Raimondi Stone and the second a gold plaque in the Museo Rafael Larco Herrera in Lima. The Raimondi Stone is a beautifully finished granite slab carved with a figure in relief which is so elaborated with kennings as to suggest that it represents a deity (fig. 10). It was found in the ruins of the temple of Chavin about 1840, but no record of the precise location was made; it has been exhibited in Lima since 1874. 18 The slab is 198 cm. long and 74 cm. wide, making it the largest relief slab showing a single figure which has been found at Chavin. The deity represented on it is a being of human form standing in full face position and holding a vertical staff in each hand. He is not the Smiling God, because he has a mouth with turned down comers and is provided with both upper and lower canines. Furthermore, he lacks ear pendants, although this feature is not necessarily as significant as the mouth treatment and the position holding two staffs. Let us call him the Staff God. The Raimondi Stone was meant to be set vertically, no doubt in a wall. The figure of the deity takes up only the lower third of its total height, the rest of the length of the stone being filled with extraordinarily elaborate figurative treatment of the Staff God's hair in which a common late. ( kenning, hair compared to a tongue coming out of a mouth, is multiplied by repetition to fill the space. The figure of the god could not be elongated to fill the slab, because to do so would violate accepted canons of proportion of the human body, and the multiplication of hair kennings was an ingenious solution to the artist's problem of making the representation of the god fit the stone. The Raimondi Stone is carved with the same care and has the same unusually fine finish as the relief slab from the terrace setback which represents the Smiling God. The relation between the latter slab and the Great Image seems to be that the slab, which is later in style than the cult image, serves the purpose of providing a representation of the Smiling God out in the open on a wall of the temple where worshippers who would not be admitted to the inner sanctum where the original image was could see it. The first part of my argument is that the Raimondi Stone is an analogue of the slab representing the Smiling God and thus a representation of another image worshipped in the interior of the temple. Since the Raimondi Stone is the larger of the two slabs and the kennings on it are more elaborate, it should represent a deity which, at the late period when the Raimondi Stone was carved, was more important than the Smiling God. The deity of the new temple was the one at Chavin who became more important than the Smiling God, so the Staff God should be the deity of the new temple. The gold plaque in the Rafael Larco Herrera Museum which figures in the second part of the argument lacks provenience but is in a pure and relatively late Chavin style (fig. 23). It represents a figure which, from its pose and treatment of the mouth, we can recognize as the Staff God of the Raimondi Stone without the elaborated figurative treatment of the hair. To right and left of the Staff God are abbreviated figures of attendant angels which combine human and bird attributes like the angels on the columns at Chavin. The combination on the plaque suggests that the angels shown on the columns are specifically attendants of the Staff God. If so, the Staff God belonged in the temple behind them. The Staff God is the only deity of Chavin religion whom we can recognize on the basis of present evidence as having more than local importance. The other gods we have been able to identify, the Smiling God and the cayman deity, are not known outside of the area around Chavin. An image found at La Copa perhaps represents another local deity of this type. 21 It should be remembered, however, that the evidence we have is still very fragmentary, and that future work may bring to light many other Chavin gods, some of whom may prove to be as widely popular as the Staff God. We have now discussed the representational meaning of most of the complete figures which appear in Chavin art. There are also many abbreviated figures, the meaning of which is much less clear, particularly on pottery and gold ornaments. These abbreviated figures include human, cat, bird, and snake heads or simply generalized agnathic faces, and individual features out of context, such as eyes, hands, feathers, jaguar markings, and dotted circles which represent snake markings. We can usually recognize a bird head as a bird head, for example when we find it on a Cupisnique bottle from the north coast, but we cannot yet tell whether the abbreviated figure is purely decorative or whether it is intended to convey also some religious meaning. In spite of the problems that remain, we are now in a position to-look at Chavin art with some understanding as well as to appreciate its purely aesthetic value. It is a religious art, but it is also a highly intellectual one, produced for people who were willing to have their minds challenged as well as their emotions. For us who approach Chavin art without knowing the language, the religious ideas, or the mythology of the men who made it, the problem of understanding what they meant to say is indeed comparable to the problem of deciphering an unknown script. The Chavin style came to an end about 300 B.C., but we know little as yet about the attendant circumstances. Perhaps its spread had been associated with military conquest and the central power collapsed, or perhaps a movement for religious reform developed and brought with it a simpler style. Perhaps the style itself simply became more and more abstract, so that the old rules disintegrated. At any rate, come to an end it did, and there followed a period characterized by the development of many distinctive local styles in the area which the Chavin style had once dominated. The Chavin style must have left some sort of a tradition, however, as Roman art left a tradition in the Middle Ages, because we find both imitations and derivatives of it in later times. Imitations of Chavin style are particularly prominent in the pottery style of Moche, while deities in the pose of the Staff God are found in the Middle Horizon religious art of Huari and Tiahuanaco. The shapes of the finer vessels in the Moche style and its emphasis on naturalistic modeling appear to represent a deliberate revival of the corresponding features of the Cupisnique style, the local variety of the Chavin style in pottery. This revival followed a period of some centuries during which the pottery of this area was quite different. In the third phase of the Moche style there are also a number of vessels which are decorated with remarkably faithful imitations of Chavin incised designs. 23 There is no question about the date and associations of these pieces, for several of them have been found in graves with ordinary Moche style pottery, and they display some characteristic Moche features mixed with the revived Chavin ones. The Huari and Tiahuanaco styles of the Middle Horizon flourished about A.D. 580 to 930, the first in Peru and the second in northern Bolivia and neighboring areas. The two styles display variants of a common tradition of religious art the immediate origins of which are obscure. The Huari and Tiahuanaco styles have as one of their most prominent deity subjects a full face figure of human form holding two staffs, like the Staff God of Chavin. In fact, it seems likely that all deities in these styles were depicted in the Staff God pose. In the Huari style, but not at Tiahuanaco, deity figures have a jaguar mouth. 24 In both styles deities may be accompanied by attendant angels, sometimes with the heads of hawks. 25 These resemblances to Chavin are of a different sort from those of Moche, however; they represent a transmission of particular religious conventions. There are no known Huari or Tiahuanaco pieces which show an attempt to imitate the actual Chavin manner, like the attempt made by the Moche potters. One way or another, however, it is evident that Chavin art and Chavin religion cast a long shadow in ancient Peru. Figure #1 - Location of some archaeological sites of the Chavin and Paracas cultures. White circles, Chavin sites; Black circles, paracas sites. Figure #2 - Plan of the ruins of the temple of Chavin, surveyed in 1963 by J.H. Rowe and Marino Gonzales Moreno. Figure #3 - Plan of the Black and White Portal. Figure #4 - Verticle profile and elevation of the facade of the New Temple, with the Black and White Portal. Figure #5 - Side view of the Great Image, based on a photograph made by Abraham Guillen. Phase AB. Figure #6 - Roll-out of the reliefs on the "Tello Obelisk" based on rubbings made by the author. Phase C.
Figure #7 - Reference key to the figures on the "Obelisk." Figure #6&7 Overlay - The "Obelisk" relief with the reference key superimposed over the rubbing. This is a large file. It may take some time to download.. Figure #8 - Roll-out and reconstruction of the guardian angel figure from the north column of the Black and White Portal. Figure #9 - Roll-out and reconstruction of the guardian angel of the south colun of the Black and White Portal, with the face of an eagle. Figure #10 - The Raimondi Stone, ornamented with a representation of the Staff God. Figure #11 - Early style eagle reconstructed on the basis of fragments of a cornice found near the southeast corner of the New Temple (second addition). Another fragment with the same figure was found in frount of the east face of the old south wing. Phase AB. Figure #12 - Eagle represented on a cornice found in 1919 at the place marked 3 on the plan (fig. 2), reconstructed on the basis of what remains of the original and of a plaster cast in the Museo Nacional de Antropologia y Arqueologia, Lima. The body of the eagle, destroyed in the original (dashed outline), has been reconstructed to agree with the fragments of similar eagles found in 1958 (see fig. 13). Phase AB, but later than fig. 11. Figure #13 - An eagle like that of fig. 12 but with one less figurative element in the wings. Reconstruction on the basis of fragments of a cornice discovered in 1958 near the place marked 3 on the plan (fig.2). Probably contemporary with fig. 12. Figure #14 - Fragment of an eagle of a late style from a cornice stone found at the northeast corner of the old south wind of the temple of Chavin. Phase D.
Figure #15 - Profile hawk from the cornice of the Black and White Portal. Phase D.
Figure #16 - Profile eagle from the cornice of the Black and White Portal. Phase D.
Figure #17 - Felines and serpents from the cornice at the southwest corner of the New Temple (no. 1, fig.2), drawn on the basis of a rubbing made by the author. The felines are on the under side of the cornice and the serpents on its edge. Phase AB. Figure #18 - Roll-out of the figures of a relief found in Yauya. The figures are an almost complete mythical cayma and part of the nost of a second one. The drawing is based on a rubbing made by Fred D. Ayres (Rowe, 1962, fig.31). Figure #19 - Reconstruction of the figures ornamenting two fragments of a granite lintel found in 1962 at the foot of the monumental Stairway (no4, fig.2). Two profile caymans are represented. The reconstruction is based on two rubbings and a photograph of the original. Figure #20 - Figure of a warrior which formed part of a frieze of similar figures. The drawing is based on a rubbing made by the author. Figure #21 - Representation of the Smiling God from a slab found in the patio of the New Temple (no.2, fig.2). The drawing is based on a rubbing made by the author. Phase D.
Figure #22 - The Staff God represented on a pyro-engraved gourd found in a Paracas tomb in the Ica Valley. The gourd is in the Paul Truel Collection. Drawing by l.E. awson and the author. Figure #23 - The Staff God represented on a gold placque without provenience in the Museo Arqueologico "Rafael Larco Herrera," Lima. The inlays which decorated the original are missing. Drawing on the basis of a photograph in the Museum of Modern Art, New York (Rowe, 1962, fig.27). 1 This study is a revision, written in 1967, of a paper originally written for a publication of the Museum of Primitive Art of New York (Rowe, 1962). The illustrations provided are a different selection from those which appeared with the 1962 version, and a selection which I believe is more appropriate to the text. Except as specifically acknowledged in the text, the ideas and interpretations presented here are my own and are based on direct examination of the original evidence. The unsigned drawings are the work of the following illustrators: Zenon Pohorecky (figs. 10, 11, 15, 16); Janet C. Smith (figs. 6, 7, 8, 9, 12, 18); and Robert Berner (figs. 1, 14, 17, 19). 1961	Rubbings from Chavin de Huantar, Peru. American Antiquity, vol. 27, no. 2, October, pp. 238-245. Salt Lake City. 1942 Chavin stone carving. Yale Anthropological Studies, vol. III. New Haven. 1944 The north highlands of Peru; excavations in the Callejon de Huaylas and at Chavin de Huantar. Anthropological Papers of the American Museum of Natural History, vol. 39, part 1. New York. 1954 Ancient arts of the Andes. The Museum of Modern Art. New York. 1957 Huaras - Chavin. Juan Mej1a Baca & P. L. Villanueva, Editores, Lima. 1948	La cultura Chavin; dos nuevas colonias: Kuntur Wasi y Ancon. Revista del Museo Nacional de Antropologia y Arqueologla, vol. II, no. 1, primer semestre, pp. 99-172. Lima. 1956 Curayacu - a Chavinoid site. Archaeology, vol. 9, no. 2, June, pp. 98-105. Brattleboro. 1957 An introduction to Old Norse. Second edition, revised by A. R. Taylor. At the Clarendon Press, Oxford. Andesu no iseki. Mizue, no. 22, Winter quarter, Supplement. Tokyo. Cordillera Blanca (Peru). Universitats-Verlag Wagner, Innsbruck. 1926 Archaeological explorations in Peru. Part I: Ancient pottery from Trujillo. Field Museum of Natural History, Anthropology, Memoirs, vol. II, no. 1. Chicago. Peruvian archeology in 1942. Viking Fund Publications in Anthropology, number four. New York. 1941 Gold ornaments of Chavin style from Chongoyape, Peru. American Antiquity, vol. VI, no. 3, January, pp. 250-262. Menasha. 1951 Gold artifacts of Chavin style. American Antiquity, vol. XVI, no. 3, January, pp. 226-240. Menasha. 1934 Des commentaires sur l'architecture ancienne de la cote peruvienne. Bulletin de la Societe des Americanistes de Belgique, no. 14, aout, pp. 75-110. Bruxelles. 1964 The Paracas pottery of Ica; a study in style and time, by Dorothy Menzel, John H. Rowe, and Lawrence E. Dawson. University of California Publications in American Archaeology and Ethnology, vol. 50. Berkeley and Los Angeles. 1899 La piedra de Chavin. Boletin de la Sociedad Geografica de Lima, ano IX, tomo IX, nos. 4-6, 30 de septiembre, pp. 192-2.31; nos. 7-9, 31 de diciembre, pp. 262-290. Lima. 1945 Tihuanacu, la cuna del hombre americano; Tihuanacu, the cradle of American man. I-II. J. J. Augustin Publisher. New York. 1960 The origins-of Creator worship among the Incas. Culture in history; essays in honor of Paul Radin, edited by Stanley Diamond, pp. 408-429. Published for Brandeis University by Columbia University Press. New York. 1962 Chavin art; an inquiry into its form and meaning. The Museum of Primitive Art. New York. 1929	Kunst und Kultur von Peru. Im Propylaen-Verlag zu Berlin. 1923 Wira Kocha. Inca, vol. I, no. 1, enero-marzo, pp. 93-320; no. 3, julio-septiembre, pp. 583-606. Lima. 1943 Discovery of the Chavin culture in Peru. American Antiquity, vol. IX, no. 1, July, pp. 135-160. Menasha. 1959 Paracas. Primera parte. Publicacion del Proyecto 8b del Programa 1941-42 de The Institute of Andean Research de New York. Empresa. Graphic T. Sachet S.A. Lima. 1960 Chavin; cultura matrix de la civilizacion andina. Primers parte. Publicacion Antropologica del Archivo "Julio C. Tello" de la Universidad Nacional Mayor de San Marcos, vol. II. Lima. 1957 Nuevos descubrimientos arqueologicos en el Peru: Chavin. Cuadernos Americanos, ano XVI, vol. XCIII, no. 3, mayo-junio, pp. 180-184. Oxico. 1951 The Chavin problem: a review and critique. Southwestern Journal of Anthropology, vol. 7, no. 2, Summer, pp. 103-144. Albuquerque. 1932 Las Falconidas en el arte y en las creencias de los antiguos peruanos. Revista del Museo Nacional, tomo I, no. 1, pp. 33-111, Lima.